Alternative name: Vienna pattern, Large Crown. In the 16th and 17th century Lyon in France was a centre of playing card manufacturing not only for the French market but for export to the German countries also. In records of the 18th century one of the patterns made in Lyon for export is named “portrait d’Allemagne” (IPCS # 62). Beginning c. 1700 this Lyon export pattern was copied more and more by German makers of playing cards. In the second half of the century the first decks with double headed figures appeared. From c. 1784 the manufacturing of playing cards developed to a higher extent in the Empire of Austria. Aloys and Johann Norbert Hofmann started to build major factories in Vienna. 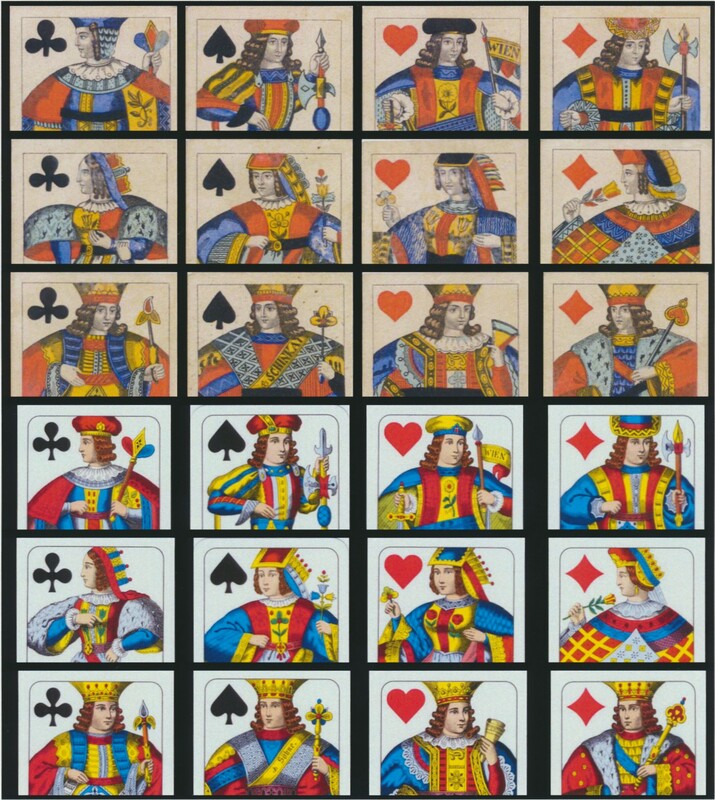 From the latter originates a version of the portrait d’Allemagne with format filling figures where the crowns of the kings are truncated by the edge of the cards. The next generation of makers of playing cards in Vienna took over this kind of typical portrayal which became thereby the Vienna pattern, Type A. From the late 1850s on steel engraving becomes more and more the method of making playing cards in Austria. Thereby the Vienna pattern, Type A gets its final profile by the engravers Josef Sürch and Josef Neumayer. The artwork of today’s pattern of Ferd. Piatnik & Sons originated from the latter one in 1885. The pattern is known only double headed without a recognizable dividing line. It looks antiquated due to the preponderance of ornamentic elements. All figures (except Jack of Clubs in older versions) have artificially curled brown hair. Jack and Queen of Clubs as well as Queen of Hearts are shown in profile looking left. All other figures are full faced looking left or right. Jack of Diamonds wears a hat while the other ones wear a cap. Jacks of Clubs and Hearts hold a baton, the other ones a halberd. Usually Jack of Hearts carries a pennant with the name of the town of manufacture. Queens of Spades and Hearts wear crowns with flat front. Queens of Spades, Hearts and Diamonds carry flowers. All Queens have very roomy sleeves. The crowns of the Kings are without spikes truncated by the edge of the cards. The King of Hearts carries a scroll while the other ones hold a sceptre. Usually the maker’s name is printed on a sash held by the King of Spades. 24 cards, Ace, K, Q, J, 10, 9 (Schnaps-karten); 36 cards, Ace, K, Q, J, 10 to 6 (Preference); usually all cards without indices. Nowadays 52 cards + x J as well, Ace, K, Q, J, 10 to 2 (Rummy, Bridge, Canasta) with indices. Norbert Hofmann, Max Uffenheimer, Johann Georg Steiger, Carl Holdhaus, Anton Moser, Ferdinand Piatnik (& Söhne), Carl Titze (& Schinkay), Josef Glanz, all Vienna. Ferdinand Pittner, Graz; S.D. Modiano, Triest; Piatnik Nandor es Fiai, Budapest; Flemming-Wiscott AG, Glogau; Vereinigte Altenburger und Stralsunder Spielkartenfabriken A.-G., Altenburg; Leinfelden. Reisinger, Klaus: Von Lyon nach Wien, Die Entstehung des Wiener Bildes, Wien 2000; Mann, Sylvia: All Cards on the Table, Leinfelden-Echterdingen und Marburg 1990, p. 106f; Janssen, Han: de geschiedenis van de Speelkaart, Rijswijk 1985, p.106ff; Wowk, Kathleen: Playing Cards of the World, Guildford 1983, p. 58f; Beal, George: Playing Cards and their Story, London 1975, p. 61ff. Top three rows: C. Titze & Schinkay, Wien, c. 1860, older version; Bottom three rows: Ferd. Piantnik & Söhne, Wien, 1981, younger version, still in production. For differences between both versions compare Jack and Queen of Clubs.